It is one of the best video games of the year, one of the most daring developed by a major studio this generation, and one of the most beautiful to ever run on any machine. It stumbles from some awkward glitches and some game design over-reach, but it is superb in a surprising number of small ways. Refreshingly, it is a game about America that doesn't settle for simple fictions when the uncomfortable truths about the United States' history would be more interesting. Plus, it's the best tree-climbing simulator in history. Really, you might want to play Assassin's Creed III just for the trees. Assassin's Creed III is primarily set before and during the American Revolution. Like its predecessors it occasionally switches to modern times, and that parellel timeline has become more pressing than ever: The modern-era part of the game is set in the weeks before the supposed December 2012 destruction of planet Earth. The game is played in third-person across a massive stretch of late-18th-century frontier as well in bustling Boston and New York. The game's cities are packed with things to do: buildings to climb, people to kill, dogs to pet, guards to avoid, assassins to recruit, almanac pages to collect, underground mazes to explore, tomahawks to buy, plague-infested blankets to burn and much, much more. The cities are more densely populated with activites than past Assassin's Creed games, and the frontier is more fun thanks to the ample opportunity it affords gamers to hunt animals, stalk redcoats, climb cliffs, and admire waterfalls. If you're getting the sense that there's a lot of stuff in this game, you're right. I'll try not to list all of it, because as busy as the game is, and as nice as it is that you can finally stack quests, the quiet moments in the game are to be cherished. Sometimes, the best thing to do is just explore the wilderness with no goal at all. Do this, and you'll wind up on some unexpected side adventures (an early mission has you tracking down whatever it really was that Daniel Boone thought was a Sasquatch). The player mostly controls a Native American of mixed heritage named Ratonhnhaké:ton or, as he is referred to mostly in the game, Connor. Connor is not the charmer Ezio was. He's actually rather irritable and not as fun a man to be as his assassin ancestors. But his journey is a moving one and is ultimately, supremely satisfying. You control Connor from his childhood all the way into his assassinating prime. Yet AC III has some surprises in store. In this case-and without giving things away-the game's extended early sequences will allow you to put off playing as Connor for as many as five hours (which is as long as I held out), if not even more. For the sake of readers sensitive to spoilers, I'll skip mentioning just what it is you can do in the game for so long before you assume the role of Connor. The answer emerges within 15 minutes of playing the game yet masks even more twists, each of which is wound throughout the rest of the adventure. There is, however, a necessary warning surrounding this part of the game: AC III is a slow starter and much of what is most commendable about it, as with last year's equally grand The Legend of Zelda: Skyward Sword, is held back during what some might view as the game's lengthy interactive prologue. Eventually, Connor's training is complete and, in chapter six of a 12-chapter game, the world finally opens up in grand fashion. There is the framing device: the 2012-era adventures of Desmond Miles the supposed savior of the world who is ostensibly living the lives of various assassin ancestors of his each time he gets in a device called the Animus. In the first Assassin's Creed, players controlled Desmond very briefly and mostly played through a series of assassination adventures committed by his ancestor Altaïr Ibn-La'Ahad during the 12th-century Crusades. In Assassin's Creed II, AC: Brotherhood and AC: Revelations, Desmond mostly re-lives the playable memories of 15th century Renaissance Italy assassin Ezio Auditore da Firenze. Connor is yet another of his ancestors, though we never play just as them. With each game, Desmond's playable sections expand. In AC III Desmond has his biggest part yet, and players will be using the modern character to explore, too. Desmond's climbing tasks prove to be some of the game's most interesting. (Again, surprises lurk and you'd probably prefer I don't tell you). The sailing and cannonballing could be a game of its own. Connor can command a formidable ship called the Aquila and sail it into several side missions, rich with combat and discovery. The naval warfare is as dramatic a tonal shift in gameplay styles as was the tower defense game in last year's Revelations, but while that regrettable add-on controlled badly and was a bore, naval combat is among the most responsive and satisfying activities in the series. The player can upgrade the ship, sail it through several merchant missions against rival ships, using various types of cannon shot and strategic wind-harnessing to sink armadas and obliterate forts. (See what I mean about lists and lists of features?) Assassin's Creed III is bountiful-just as the Desmond sequences offer at least two different and interesting types of gameplay, the naval section of the game entails the merchant missions that make it cheaper to trade goods (yes, the game has an elaborate trading and crafting system), major naval combat missions which advance a sea-based narrative off-shoot, and a series of levels that tie into discovering lost pirate treasure. Oh, and there are naval missions mixed into the main campaign, too. The core of Assassin's Creed games is the hunt-and-be-hunted gameplay. That's Connor's main deal. 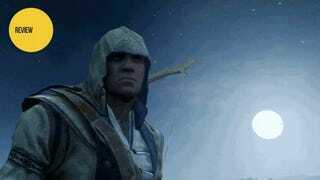 Like Altair and Ezio, he is a member of an ages-old order that fights an ages-old battle against the Templars. Theoretically the freedom-loving Assassins are the good guys, but that's always been a bit murky and made even murkier in this game, the most morally gray, by far, of the series. As his predecessors could before him, Connor can walk, run, scale the face of a building, creep up on his targets, engage them in melee or ranged combat (he's good with a tomahawk, pistol and bow, mostly), or sometimes just eavesdrop or sidle in for some pickpocketing. The Assassin's Creed games have never controlled much better than a mostly-trained dog, so at times Connor will seemingly defy the player's inputs, scaling partway up a building instead of running down the alley next to the building. Sometimes his horse gets tangled up in the forest bushes instead of galloping down a path. Sometimes standing up out of cover will ruin a mission when all you wanted Connor to do was prowl, crouched, to the next hiding spot. Most of the time, though, the game plays fine and Connor's two-handed fighting techniques make him a vicious and fun action hero to control. A ring of enemies still mostly take their turns attacking, but they are far better at blocking, countering and resisting Connor's chain-killing moves and attempts to disarm them than Assassin's Creed enemies of the past. In this game, players will die much more than in the last few games, mostly through faults of their own. The game's creators do a good job of mixing up Connor's missions (that's a full one in the video above, from about two-thirds into the game). Sometimes you're just tasked with assassinating someone in Boston. Other times, you're riding a horse with Paul Revere to warn people that the British are coming. Sometimes you're commanding dozens of troops at war with Redcoats. And then there are missions like the Boston Tea Party, which are made clumsy by the game's box-throwing controls or the late-game mission that requires a rapid gallop through the forest yet is nearly ruined by the terrible tendency of the game's horses to go off the beaten path. Despite the abundance of AC games, though, the mission design feels fresh and is full of new turns. There is also lots of historical tourism, so when you're not meeting Sam Adams or Ben Franklin, you're witnessing the Boston Massacre firsthand or running around the battle of Bunker Hill. WHY: Because it may not be the best Assassin's Creed but it is a refreshing recharge to a well-made series. It's an important game about America, about killing bad guys and about climbing beautiful trees. Finding a lot of the old, tired elements of Assassin's Creed freshened up, a perfect complement for the game's many narrative surprises. The writing. Really. From the smartly-written in-game database to the broader, simpler fact that this is not a game that worships America's founding fathers blindly. Riding horses. They never go where you want them to. They often get stuck. The AI. The guards in these games need to be smarter or at least give a damn if I'm killing their buddies even if said killing is happening more than 30 feet from their post. "This is no minor series update. It deserves a number at the end of its title." "Plays better with its day one patch; maybe could use another." "The Desmond sections are getting better, and the naval combat's indisputably terrific!" Publishers from big video game companies are not known for subtlety or complexity of theme, and games set in America or tied to America's great military victories tend to wave the flag without pause. The marketing always suggested that ACIII's igniting of the Revolution would be a game of interactive jingoism; its developers always said it was not. The developers were the ones being accurate. Fortunately, the game is refreshingly skeptical about the values fueling the Revolution while not knee-jerk anti-American, either. The characters acknowledge the hypocrisy of freedom-loving Founding Fathers owning slaves just as they celebrate their resistance to non-democratic tyranny. Connor is no mere change of skin tone for the series' protagonists; he is a man whose people will not win in the new America, and the game presents that painful truth not as a side element or history-textbook-footnote but as one of the main currents that pushes ACIII's story along. This new game's developers earn the player's trust and respect repeatedly throughout the game, not just because of the story they're choosing to tell but because of how smartly and carefully they have re-thought most of Assassin's Creed's side content. They vowed to avoid repeating many of the gameplay loops of previous Assassin's Creed games and, for the most part, they did. You may still have to climb to the tops of buildings (or massive trees!) to survey the land and fill out a mini-map, and you may still be able to pull wanted posters from walls to reduce the heat level that compels guards to chase you. But in so many ways, the old systems of Assassin's Creeds have been chucked for better ones. For example, the series used to hide collectible items in high perches. The new one still does, but some of those collectibles-almanac pages-blow away in the wind. You need to chase after them. The old games let you unlock locations in the cities that would let you fast-travel to other parts of the cities. The new game allows for large-leap fast-travel, but in cities, the game's creators now turn each effort to unlock an intra-city fast travel conduit into an Assassin's Creed version of a maze-filled dungeon. Some of the old games let you raid towers; the new one has you infiltrating and dismantling the defenses in forts. The old games let you join with thieves or brawlers and run some missions for them; the new game teams you with Daniel Boone or other frontiers-people to investigate clues and strange sightings on the frontier. Some of the old games let you upgrade a villa; the new game lets you upgrade an entire homestead, tasking you with meeting people who will set up homes and businesses there, running missions involving those people and even having something of a Pokemon Snap-style photography system for capturing scenes of the homesteaders doing various interesting things. I could go on, but that's plenty. Oh.. one more: the concept of recruiting assassins is back, as is sending them away on missions (this time across the eastern seaboard), but this time, the assassins that can be recruited are specific characters with specific needs and the abilities that having a cadre of assassin recruits unlock are more than just "please kill that guy for me." What's striking about Assassin's Creed III is both how many elements it has and how well-made most of them are. Ubisoft puts an army of developers on their AC games and it seems that these armies have tried to out-do each other, with so many parts of the game that could be side-projects rivaling the game's main quest in level of quality. All that said, it is equally striking how precariously Assassin's Creed creaks under the weight of its developers' intent. I played the game on the PlayStation 3 and don't know if it's the six-year-old hardware to blame or the game's programming, but AC III is a game that will birth many a glitch memes. Even a day one patch has not cleansed the sprawling open world from the occasional malfunction. I had no crash bugs. And the one mission-ruiner I experienced early on-it involved a guard being artificially un-intelligent-has been patched out. This game is, however, simply a great producer of screw-ups. Most don't affect gameplay. They just look or sound silly. In the 20 hours I played, I saw one guard standing, waist-deep, inside a wooden cart, as if it was built around him; I heard the sounds of combat during a single enemy encounter play in a very, very wrong way (see/hear the video above) and I got a cannonball to stall in mid-air because it was fired right as a cutscene began. In one underground maze I entered a room that had malfunctioning textures that displayed beams of wood as flashing, static-y rainbows. Across 20 hours, those were nearly all the glitches I found, so they were not enough to ruin the game-not close to it-but more than plenty to merit a warning. Unfortunately, our Kirk Hamilton, who has been playing the Xbox 360 version, says he's seeing more frequent glitches: nothing game-ruining for him, but clumsy transitions in and out of scenes, music cutting off when it shouldn't, civilians vanishing into thin air, and the occasional AI screw-up. Combine this with the fact that the game's enemies do betray some standard video game stupidity (the soldiers in one corner of a huge fort stay at their post while I'm loudly murdering their captain and buddies at the other end), and you wind up with a game that feels like it would benefit from a couple more patches and a more powerful machine. The glitches didn't affect gameplay and were infrequent. They are, however, prevalent enough that when, say, you're in the frontier and can't find the treasure trinket that your map and a buzzing audio cue indicate should be right in front of you, first you think that maybe the trinket is in a tree. Then you wonder if maybe it just didn't load in the scene because of a glitch. Whatever it is that compels you to climb a tree in Assassin's Creed, you are in for a good time as you get up there. Everything else I've written here is secondary to the feeling of smoothly running up the trunk of one tree and then skipping from branch to branch through the forest with a grace usually reserved for ballerinas or gazelles. Given that neither ballerinas nor gazelles do their thing in the canopy of an 18th century forest, advantage: Connor. Advantage: Assassin's Creed III. The title Assassin's Creed III is a lie insofar as this is the fifth console Assassin's Creed game. Ubisoft put the number on there to sell the game better and to sell the idea of radical change. The number is earned. The game is not just set in a radically different place at a very different time; the sense of reinvention permeates from the game's core. ACIII packs surprises big and small, veers away from habits of the older games, and looks a hell of a lot better than them, too, thanks to a new graphics engine. All things considered, it winds up perhaps not as refined as Assassin's Creed Brotherhood, but far more satisfying and well-crafted than the rough draft of Assassin's Creed 1. Connor may not have Ezio's flair, but he has a game that rivals the quality of the Italian's trilogy. Cautious consumers might want to wait for the inevitable subsequent patches, but those who don't mind a few cosmetic bugs should have no fear. This is a great game. P.S. The game has multiplayer too, with a story and some design twists of its own. Having only played a few missions of it, I'll reserve any critical assessment for now. I will update this review within the next week with a fuller take on that aspect of the game. For those looking for just some basic details, Brotherhood and Revelations' multiplayer is back, pitting players against each other in challenges to find and kill each other, as everyone hides in crowds full of computer-controlled civilians. There is still a lot of Modern Warfare-style leveling-up and ability-unlocking, but now there are also co-op multiplayer assassination matches and not one but two narratives that are unlocked as you play-one about the series' evil company Abstergo, which ostensibly made this multiplayer part of ACIII, the other also about the company but told by some hackers who, in a cheeky move by Ubisoft, also serve as the justification for letting players pay real money to unlock upgrades and items that could otherwise be obtained through continued play.